And thus begins the first new-city-every-day section of the trip. This was also the first day that we decided to activate our Japan Rail Passes. So, here's the thing. Foreigners can buy these passes that allow them unlimited travel on (basically) any rail line operated by JR, the nation-wide rail service that used to be owned by the government. The pass doesn't work on local subways owned by other companies, but for travel between cities there's no doubt that this is the best option. It was ~$260 for 7 days of unlimited travel, compared to ~$400 for the Shinkansen (bullet train) tickets alone. That's pretty solid. 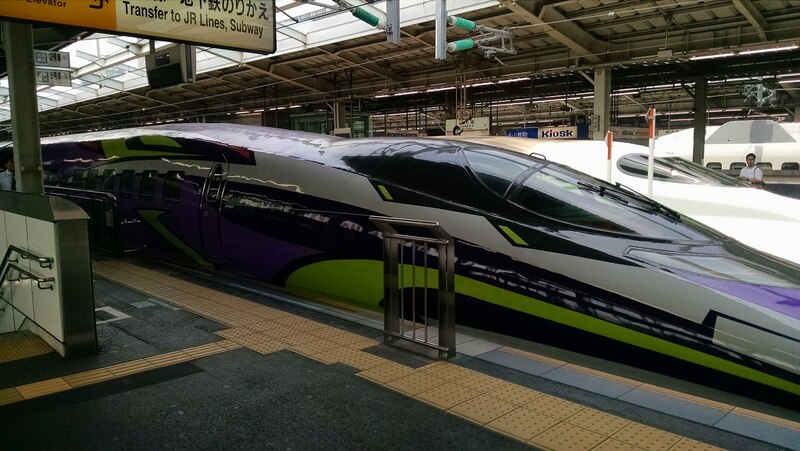 The Shinkansen train, in all it's aerodynamic glory. 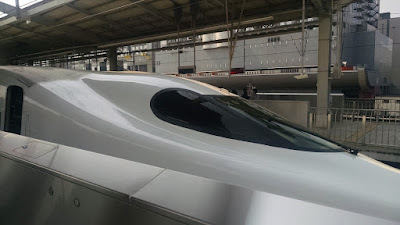 Anyhow, we got our passes, and headed out on the Shinkansen to Kyoto, about a 2.5 hour ride (we hit speeds of up to 280km/h). The ride was amazingly quiet and smooth for being a conventional track, and the scenery was pretty great too. We passed right by Mt. Fuji, and got some pretty great views of it. There was less snow on it than I was expecting though. I mean, yes, it's May, but still, I would have thought the whole top would be covered. Ah well, we can't always get what we want. Ah, the wonders of scrolling refresh. That pole is really perfectly straight up-down. Sometimes, however, we get exactly what we want, which is in this case the beautiful city of Kyoto. Absolutely gorgeous I love it so much. I wish we could have stayed longer to explore things there more, but we're kind of on a tight schedule to visit all the other places in the country we're going to. Besides, I wouldn't have cut any time from our stay in Tokyo either, so the only real solution is to come back later some day, hopefully. 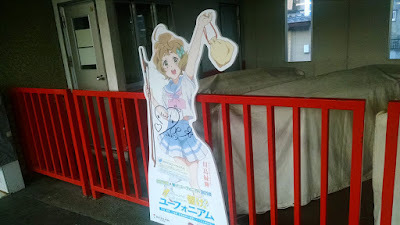 Kyoto is obviously also the home of Kyoto Animation, my favourite anime studio bar none. It's also the setting for many of their shows, and I would have loved to visit the locations they're set if I had known where they were and we had more time, but I'll just have to be content with what we got. Like the street shopping market that our accommodations were right off of. That really reminded me of Tamako Market. Another Kyoto Animation series, set in Kyoto: Sound! Euphonium. 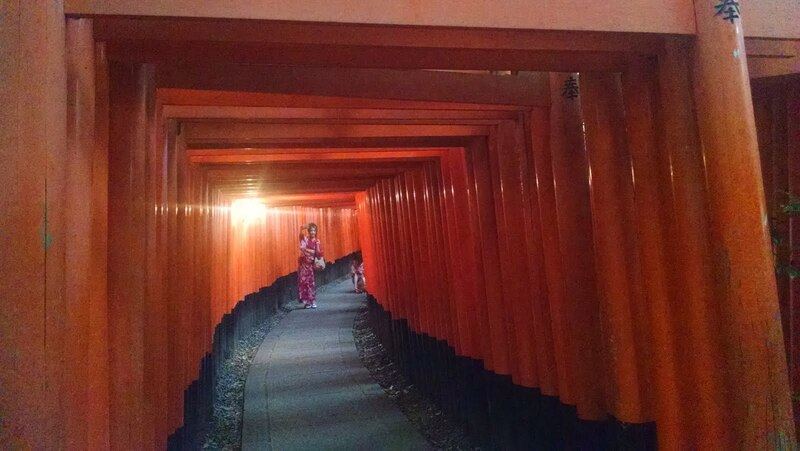 After checking into our place, we had dinner and then went off to the Fushimi Inari shrine, a super famous Shinto shrine known for the thousands of torii gates that line its paths. The shrine is built onto the side of a mountain, which is most definitely not an understatement of how much work it is to climb to the top. It was a night climb too, which was actually pretty nice, with a beautiful city view. Plus, there were kittens on the way up. It's also the inspiration for the manga series Inari Kon Kon, which I adore. It's always fun seeing the real inspiration for these places and things that I've seen in media. The food, and the buildings, and the vehicles, and the convex mirrors on street corners, and the elementary students in bright yellow hats, and the kids walking home from school in their uniforms... It's all so familiar, yet also completely foreign. Speaking of anime things in real life, I found something from Robotics;Notes. 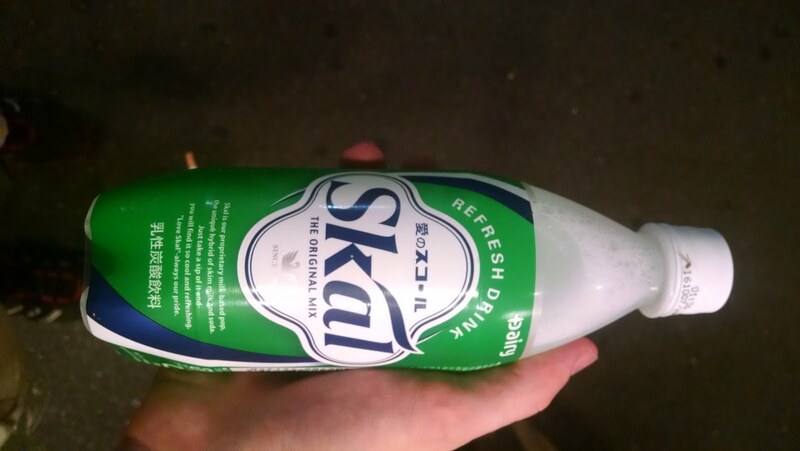 Tastes like cream soda. After the shrine we went to wander the more traditional streets, with restaurants and paper lanterns and people in kimonos. Kyoto is the most traditional of the big cities, so it was pretty special. Even though we spent all that time in transit on trains, the day still ended up with over 20,000 steps. For our stays in Tokyo and Kyoto we used Airbnb for our lodgings, which made it feel like we were much more part of the city in my opinion, rather than in a hotel or hostel. Plus, the Kyoto place had a nice collection of manga (not that I could read them, since they were all in Japanese). The plan for the day was to leave Kyoto by midday, so we spent the morning checking out the Nijo Castle, the castle built in 1601 for Tokugawa Ieasu, the Shogun at the time. It's a pretty impressive building, with an outer and inner moat and gardens and buildings. The castle wall paintings on display in the building were all replicas though, with the recall 400 year old paintings stored elsewhere, possibly on-site. I'm not sure why, but they wouldn't allow photography inside the building, even though the paintings were just replicas. I wouldn't have thought it would be that big of a deal, but whatever. 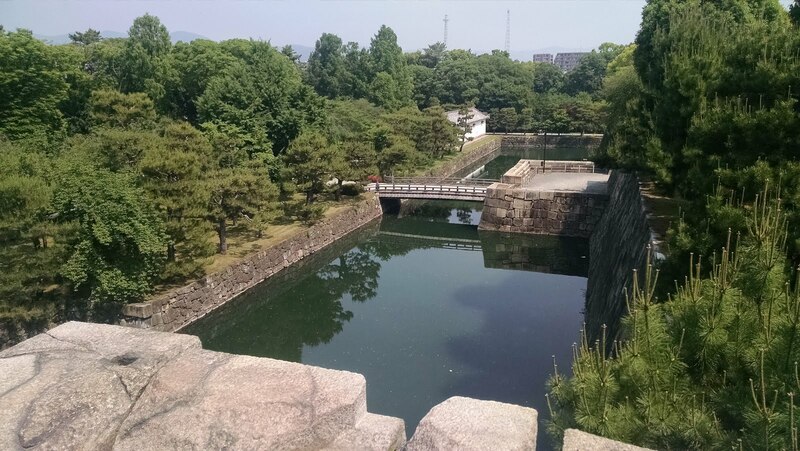 The inner moat, as viewed from atop the inner wall. There are giant koi. We kind of rushed through the castle, and then rushed off to the train station to head to Nara. 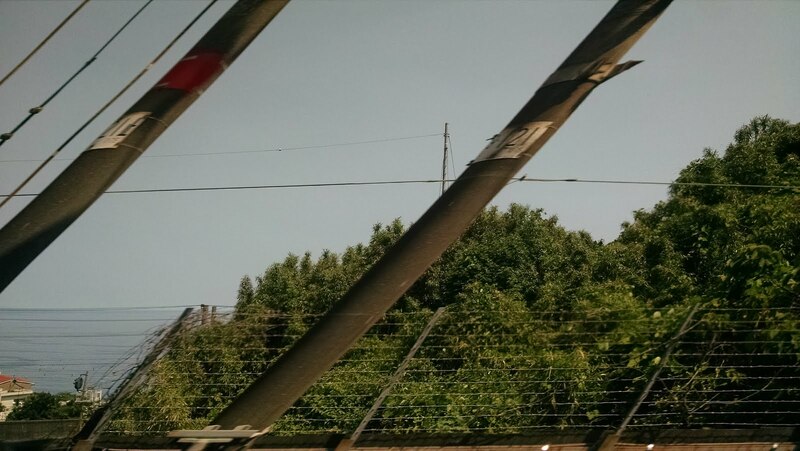 We passed through Uji on the way, the location of Kyoto Animation and Sound! Euphonium, though we didn't stop. 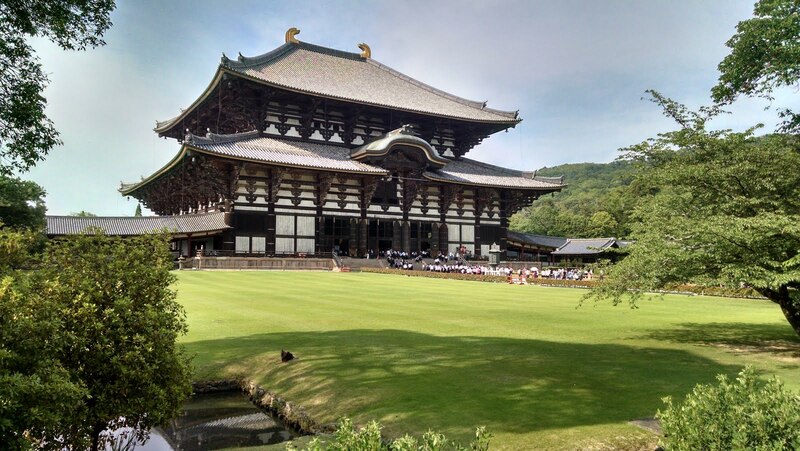 Nara is a neighbouring city known for its temples. Actually, it's mostly known for one temple: Todaiji. That's where a giant statue of the Buddha is (Daibutsu). Seriously giant though. Like, 15m tall. Nearly 50ft. 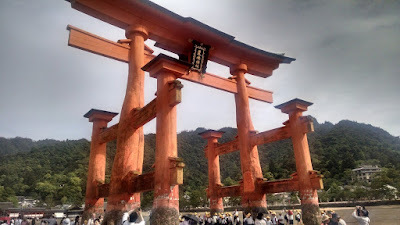 It was quite a sight to behold, though it did cost 500 yen to see. What didn't cost any money to see was the deer park. The deer there have learned how to get food from the people, and act very friendly. Jerks. We wandered around the deer park for a while before figuring out we were in the wrong area to see the Daibutsu, but eventually figured it out. It's hard to get a sense of scale of the Daibutsu, so here's the building it's housed in. To cap off the day, we made a beeline for Osaka after dinner, and stayed at our first hotel. I had thought that it was going to be a hostel, but it turned out that we each got our own tiny room, just 3 tatami mats large (that's how they measure room areas: the number of mats that fit on the floor). We decided to take it easy that night after reaching our hotel, but even so we still managed to reach 20,000 steps. We didn't have long in Osaka before leaving, but we wanted to visit Captain Terry Coffee Stadium before leaving. Sadly, Google failed to direct us properly, because it was nowhere near were it said it would be, and we never did end up finding it. The locals had never heard of it though, so we're pretty sure it's Google's fault. 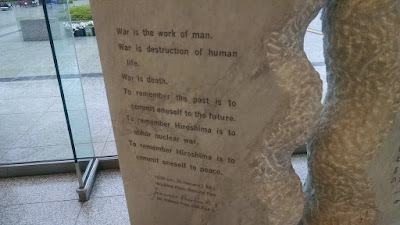 After giving up on finding it, we decided to just head off to Hiroshima, where we would be spending the next couple of days. We took the Shinkansen (another 2.5 hours), and completely without planning it, ended up on the Neon Genesis Evangelion train! Now, if you're not into anime, you don't get how cool that is, but suffice it to say, Eva is one of the biggest, most important series out there, and immensely popular. The train was painted like Unit-01, and there were NERV logos on the doors inside, and the train played a few bars of A Cruel Angel's Thesis every time it was about to stop. I had a lot of fun just being on the train, even though I'm not really a fan of the series. Eva Unit-01. It's coloured purple on the inside some too. After reaching Hiroshima, we decided to head to Miyajima, a little island inside Hiroshima Bay known for it's torii gate in the water and its mountain trails. Unfortunately we were there during the low tide hours, so the gate wasn't as impressive as it might otherwise be. What was impressive was how, when we walked out to the torii gate, there were thousands upon thousands of coins littering the sand. I guess it's kind of like the whole ocean is a wishing well. After snapping some photos, we headed out on a hiking trail up the mountain. Just like with the Fushimi Inari shrine, this is 100% a real mountain; but this one is worse. 535m tall at the highest point, Mount Misen, and oh my gosh it was tiring. Beautiful at the top, and satisfying to finish, but so, so tiring. Especially with all the other walking we've been doing. There's a ropeway near the top that we planned to take down, and we're super lucky we bumped into some other tourists when we did, since they informed us that it closed at 5:30pm, which was about 5 minutes away. Needless to say, we covered that last 0.3km in record time. It made the ride down that much sweeter though. The water rises during high tide, so it looks like it's floating. After taking the ferry back to the mainland, we headed off to our accommodations this time an actual hostel, with something like 30 people to a room. Mixed sleeping too, which was a bit odd. At least the showers were private, which is more than I can say for the previous place. All in all, it was another 20,000 step day, most of which were up the stairs of the mountain path. I'm starting to wonder if my legs will ever forgive me. This was our first day where we could sit back a bit and breath for a while. No required early morning (though the sun didn't care). No hopping to another city. Just visiting the monuments and sights of Hiroshima. A breather is nice every once in a while. Obviously, by "monuments and sights of Hiroshima" I mean the Peace Memorial and Museum and Park. 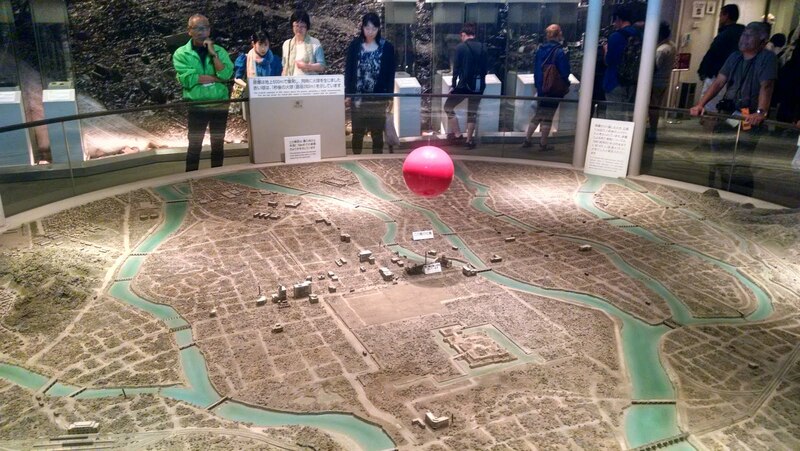 Hiroshima was, after all, the location of the first atomic weapon attack, and they have dedicated the center of their city to making sure people never forget the horror of nuclear weapons. Unfortunately, it was a very rainy day, so we didn't get to explore much of the park, but the museum was open for business If you ever go, I would recommend that groups not get a tour guide but instead get the audio tour. That way you can go at your own pace and, more importantly, hear what is being said. There were too many guests (read: school children) to hear the guide most of the time, sadly. Still, the plaques were informative. In case you can't read the caption, it's by Pope John Paul II. Ok, real talk: Nuclear weapons are terrifying. The fact that we created something that can level a city in an instant and kill some 150,000 (most of whom died painfully slowly)... And that's from a weapon that's several orders of magnitude weaker than what we have now. The effect that it has on the human body is revolting. That was actually the part of the exhibit that affected me the most: whenever they were showing / describing the bodies of the victims. There is one thing that most people seem to be confused about with nuclear weapons though. Bombs like the one used on Hiroshima aren't particularly dirty. Yes, there was fallout and radiation, but it faded pretty quickly actually. It's not like a failed nuclear reactor like Chernobyl that just keeps spitting out long lasting radiation. The bomb's radiation was immensely bad for the people at the blast site, but the ground didn't remain contaminated for long, so it was safe to live in not long after the blast. What an insane amount of destruction. That red ball is the fireball after 1 second. We probably could have been on TV if we wanted to. There were camera crews around, interviewing people in advance of President Obama's visit in 2 days. I guess it's a good thing we came when we did, because the museum will be closed during his visit. We also got to see a presentation by the former student of a Hiroshima surviver. It seems he used to give the talk himself, but he died recently. The presenter also talked about the experience of her mother, who also lived through the blast. It was very fascinating, and surprisingly easy to follow considering the presenter said she didn't learn English until she was in her 50s, I believe. After the museum, we got some pictures of the eternal flame and the A-Bomb Dome (the building almost directly under the blast site, which remained partially standing) once the rain slightly let up. Then... that was pretty much it for the day. We had ramen for lunch and okonomiyaki for supper, and just kind of chilled. Only 10,000 steps for once. Like I said, a breather is nice. Tomorrow though, it's back to the races. And hiking. Lots more hiking to come.